this is sort of depressing, we know, but its eye opening to realize how we give and take in regards to our water sources and environment. 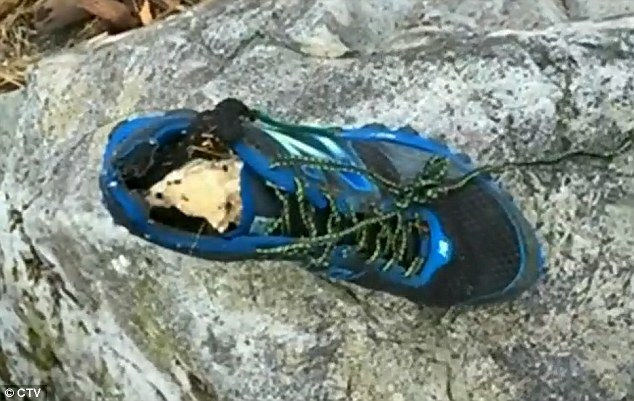 Anyways, were here today to talk about a different issue involving our ocean climate, over the past several years 16 shoes with severed feet in them have been found after washing up in either Washington or Canadas British Columbia. This may be the creepiest discovery this Canadian couple may have been through while just taking a stroll on the beach. Take a look for yourself. Charlotte Stevens and her husband were walking on Vancouver Island's Botanical Beach this past Sunday, February 7th, when they came across a single New Balance running shoe. Everything seemed normal until they looked inside the shoe and discovered whoever was wearing it last, never took it off. Charlotte still in shock told news outlet CBC the following about her and her husbands discovery, He picked it up and brought it out on to the beach, and we had a look at it for about five minutes and we thought, it almost looks like there is an actual foot bone in it. The shoe was later given to a coroner and they determined that whoever it was wearing the shoe died between March 2013 and last December and the amount of decomposition of the foot led the coroner to believe that whoevers shoe this belonged to was submerged for a good amount of time. Whats even worse is that this is nowhere near the first time a discovery like this been found in the area. what do you guys think is the reason for these strange discoveries?